This beautiful little dress is just 10 months old and currently worn by an Open Champion. It is it in immaculate condition and has been lovingly cared for in a smokefree and pet free home. There are no tan or make-up markings. 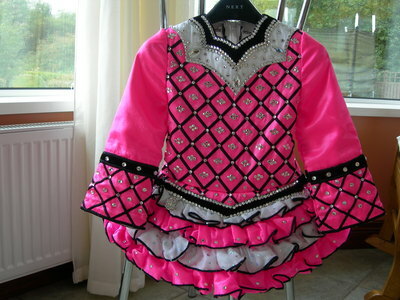 It is covered in Swarovski crystals and really sparkles on stage. The back of the dress is finished the same as the front but with a black velvet bow again with even more crystals. Pink matching head band with black criss cross and pink bloomers. This dress has never been altered but their is ample let out. Asking Price: €575. Shipping costs not included. Sale is final.